Since publishing the original Mash & Boil manual, we have found that using less strike water per pound of grain, atlhough it results in a chunkier mash, gives a substantially higher efficiency. For the most extract per pound of crushed grain, we are now recommended .30 gallons of strike water per pound instead of .37 gallons of strike water per pound. 1. Added 3.3 gallons of strike water and heated to default of 162° F.
*when the mash got too thick to stir, we poured a gallon from the bottom spigot and stirred it into the mash. We did this 2 or three times to get the entire 11 pounds mixed properly. *during this one hour period, after half an hour, we poured a gallon from the bottom valve and took off the lid and mixed it into the grain bed. 7. Boiled for 1 hour with the hops, cooled, and added yeast. Starting gravity: 1.065, which is at least 8 points higher than it would have been if we had used .37 gallons of strike water per gallon. • A hop bag or other item touching the thermostat during boiling (the thermostat is the small stainless button near the drain valve). • Setting the boil temperature too low during the initial boil. Even if you are at high altitude, for boiling, never set it below 218° F.
• Any other obstruction of the thermostat during boiling, it can also be triggered by extract brewers stirring in malt extract, which coats the bottom briefly during the dissolving period and sends the code. • House wiring problems, reverse polarity on your GFCI plug, or a voltage shortage (less than 110 volts) can also cause this code to appear. Switching to another plug can be a way of testing this. The good news is the ER4 code can be cleared by pressing the chrome reset button in the center of the bottom of the base. The bad news is most customers have their Mash & Boils full when they need to reset, and it is best to drain out a couple gallons for safety before tiling the unit to hit the button. More good news is that this error is easily avoidable by making sure hop bags do not touch the bottom during the boil, and turning off the heat if you are malt extract brewing when you stir in the syrup. 1. Added 3 gallons of strike water and heated to default of 162° F.
*when the mash got too thick to stir, we poured a gallon from the bottom spigot and stirred it into the mash. We did this 2 or three times to get the entire 10 pounds mixed properly. This was a very thick mash, and we think we will use .33 gallons per pound of grain instead of .3 gallons per pound of grain strike water next time. Because there was less strike water and grain in the Mash & Boil this time, the temperature varyed a bit more than on the first batch. The increase in thermal mass provided by the larger amount of grain and strike water in the earlier Black IPA mash made it more stable. Again, our conclusion on this one is that small grain bills should have a little more strike water than .3 gallons per pound of grain, .33 gallons per pound would be better. The slightly poorer mash efficiency of this batch versus the Black IPA would also tend to support this conclusion. The Mash & Boil requires 120 volts and 15 amps to function correctly. Please be sure your unit is plugged directly into a GFCI outlet that has a capacity of at least 15 amps. Do not use extension cords or power strips. It is vital also that the plug be wired correctly, with a good ground, and the hot lead wired to the right (narrower) slot in the outlet. If polarity is reversed (sometimes house plugs are not wired correctly), this will shorten the life of the Mash & Boil and is also a safety issue. Also, if the ground is disconnected or compromised, this is also a safety issue. We have had at least once instance of a Mash & Boil giving a customer a small shock when touched, which turned out to be a compromised house ground that was feeding a small amount of voltage back into the Mash & Boil through the ground socket on the plug. So make sure you have a solid, properly wired 15 amp GFCI outlet, and you will be fine! 1. Added 1.8 gallons of strike water and heated to default of 162° F. This was done with our R21 One Gallon Measuring cup because the Mash & Boil gallon markers do not start until 4 gallons. 4. After 30 minutes, poured a half gallon from the spigot and mixed it into the mash and recovered. 5. While mashing, heated 2 gallons of sparge water to 168° F.
6. After 70 minutes total mash time, lifted the sparge basket and began sparging. We added a total of 2 gallons of sparge water and ended up with 3½ gallons in the Mash & Boil. We figured out 3½ gallons was 7½" up from the bottom of the Mash & Boil, and placed the end of a tape measure into the unit to see when we had reached 3½ gallons (a little tricky). 7. Boiled for one hour, a more vigorous boil than when boiling 5 gallons. After 1 hour, 1 gallon had boiled off. 8. Cooled with an immersion chiller and pitched Wyeast 3944. 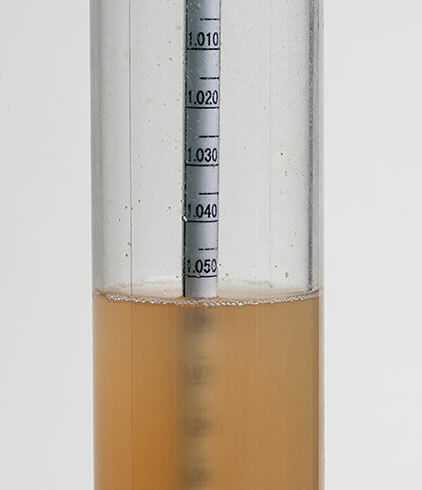 Starting gravity was 1.055.